* * * * * * * * * * Welcome to Dru's Cozy Report: December 2013. This month I have three new series for your reading pleasure, and I'm debuting a new feature to my posts: highlighting recent releases. Enjoy! 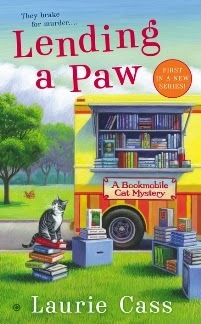 With the help of her rescue cat, Eddie, librarian Minnie Hamilton is driving a bookmobile based in the resort town of Chilson, Michigan. But she’d better keep both hands on the wheel, because it’s going to be a bumpy ride. This was a fun read which I enjoyed immensely. I loved how the story flowed from beginning to end, keeping me in suspense with plenty of suspects and a couple of twists and turns that snuck up on me. Minnie is a strong-willed and gutsy heroine and I like her determination to find a killer, even when the odds were against her. 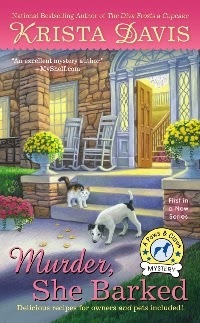 Aided by her mischievousness cat, this delightfully charming whodunit is a welcome addition to the cozy genre. Boasting a small town atmosphere and entertaining conversation, this was a terrific read and I can’t wait to see what adventures Eddie and Minnie get into on their bookmobile. The Sugar Maple Inn in Wagtail, Virginia, is the country's premiere vacation hot spot for pet owners who can’t bear to leave their furry friends behind. But this tourist town smells trouble when a killer goes on the prowl. I love this book. It’s a great read that will have you quickly turning the pages to see what happens next. This action-filled book will have you rooting for Holly and her friends as they dig deep to find a killer within their reach. The mystery was well done as it kept me in suspense with the many twists and suspects that could have done it. It was fun trying to narrow the list of suspects down. The author did a good job in keeping this light and airy whodunit fresh, entertaining and engaging with banter between the characters that I enjoyed. Holly is a great heroine supported by a lovable and somewhat eccentric cast of character that includes Holmes, Zelda, Trixie and especially Oma. I love the concept of a town catering to pets and it’s a joy to see how wonderfully they all interact. I can’t wait to see more exciting adventures in Wagtail with Holly and her friends in this delightfully entertaining series. Bonus recipes are included for both humans and our furry friends. FTC Disclosure – The author sent me a copy of this book, in hopes I would review it. Welcome to Kismet, PA, where home stager Caprice De Luca helps her clients shine in a lackluster real estate market--and where someone may only be in the market for murder. I like it. This is a good mystery that flowed evenly from chapter to chapter and kept me involved in all phases as I progressed towards a finale that was befitting this light-hearted whodunit. The author did a good job in presenting this well-staged tome with a strong sense of family starting with our heroine, Caprice whose determination to see justice puts her in the cross-hair of a killer. 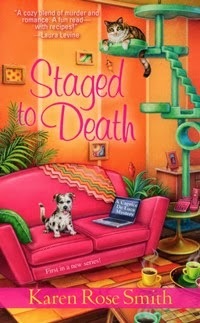 With a great supporting cast, a unique sense of style and good conversations, this is a wonderful entre into the cozy genre and I can’t wait for the next book in this enjoyably delightful series. Jordan Kelly is delighted to make money tracking down rare and valuable mystery novels for her employer, Vera Van Alst, an avid collector and the most difficult woman in Harrison Falls, New York. But now her boss’s complete set of Dorothy Sayers is missing, and finding them may lead Jordan to a murder suitable for Sayers’s esteemed sleuth, Lord Peter Wimsey. Avery Baker was a big city textile designer, until she inherited her aunt’s old Maine cottage and found her true calling—home renovation. But she never expected her latest job would come to such a bone-rattling dead end. Piper Prescott, a transplanted Yankee living in the South, has got her sass back. She might be down, but don’t count her out. “Change of life?” she asks. Bring it on. Recently divorced, Piper decides to pursue a dream she’s secretly harbored: owning her own business, Spice it Up!, a spice shop in her adopted hometown, Brandywine Creek, Georgia. But Piper’s grand opening goes awry when the local chef who’s agreed to do a cooking demo is found stabbed. Not only did Piper find the body, she handled the murder weapon and doesn’t have a witness to her alibi, making the case look like a slam dunk to brand new police Chief Wyatt McBride. Desperate to uncover the truth—and prove her innocence—Piper enlists the help of her outspoken BFF Reba Mae Johnson to help track down the real culprit. The pair compile a lengthy list of suspects and work to eliminate them using their own creative brand of sleuthing techniques including stakeouts, breaking and entering, and one very unorthodox chocolate pie. When Piper narrowly avoids being a victim of a hit-and-run, she knows she’s getting closer to the truth, but can she catch the killer and clear her name before she becomes the next victim? Bailey’s Farmers’ Market is this season’s go-to holiday destination, but not all the vendors are feeling the Christmas spirit. After Reggie is found with a tree stake in his chest, she wonders when the Christmas tree business turned so deadly. Now Becca has to use the only clues she has to the killer’s identity—mysterious ornaments that begin to show up in her stall—to hook a sinister Scrooge who will go to any lengths to drive home a point. You have just about blown my entire book budget for the first half of 2014! Love your reports, Dru Ann, and think your new feature is wonderful! Enhance your employment opportunities today get your Apply First Aid Certificate with Training Aid Australia. So many new cozies to choose from. I wish I had the time to read them all. Thanks for the post Dru.